Bring an 8-quart stock pot of water to a boil and generously season with salt. Cook pasta according to package directions until al dente. Drain pasta and rinse with cold water until cool. Meanwhile, cook corn in pasta water for 2 to 3 minutes. Drain and rinse under cold water; cut kernels off the cob. In a large mixing bowl mix pesto and avocado; mash lightly using a fork and season with pepper. Toss together with pasta and parsley. Serve on large platter. 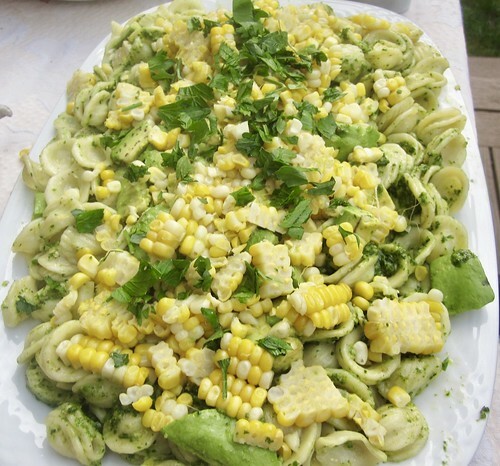 Top with corn and garnish with more parsley.